I was nominated by Living the Q Life to post a nature photo for the next 7 days. This means a nature photo a day for the next week. I also have to nominate someone else to do it, so I hope one of my fave Camino bloggers is up to the challenge. Hola, The Camino Provides! (Don’t feel obligated if you’re busy, but I would love to see some of the hikes you’re doing to prepare for El Camino). He sido nominado por Living the Q Life para compartir una foto de la naturaleza durante los próximos 7 días. Quiere decir, una foto de la naturaleza durante la próxima semana todos los días. También tengo que nombrar alguien más para hacerlo, entonces, espero que una de mis bloggers preferidas del Camino decida hacer el reto, The Camino Provides. 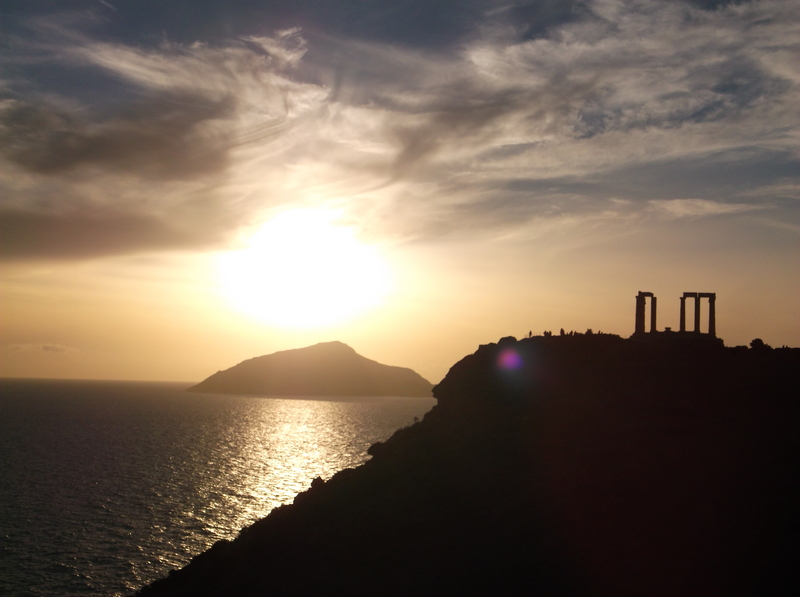 My first photo is the popular sunset over the Temple of Poseidon in Cape Sounion, near Athens, Greece. I can’t remember a more spectacular sunset (or “sun time”) in my life. It was in March 2013. La primera photo es la puesta de sol famoso de Templo de Poseidon en Cabo Sounion, cerca de Atenas, Grecia. No puedo recordar un atardecer más spectacular. Fue en marzo de 2013. Greece is a place that had been on my bucket list for quite some time, and after visiting, it remains high on my bucket list to return. It is a fascinating country full of history, beautiful places, monuments and great food. It has mild winters and superhot summers. 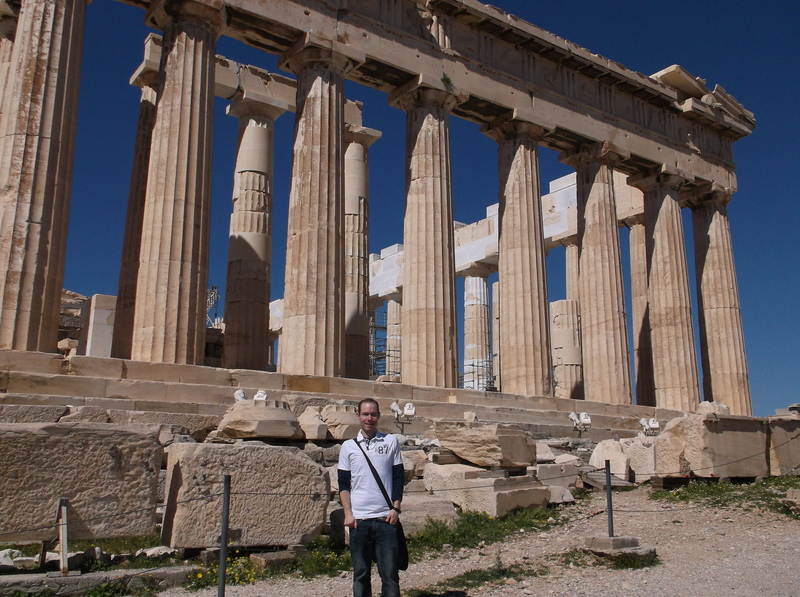 When I finally had the opportunity to travel to Athens in March 2013, it was a dream come true. The Parthenon is like no other place. High above Athens, it was the place to go at the height of the Greek empire. 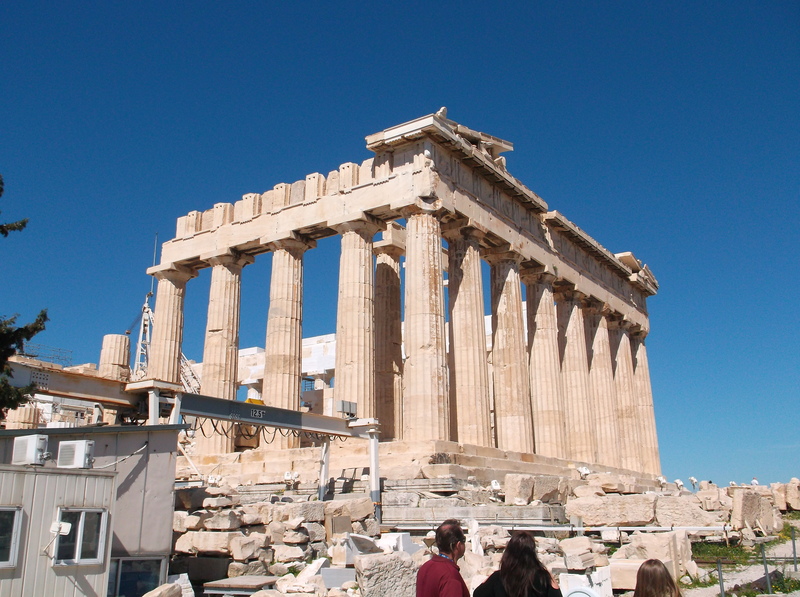 The best view to look at and contemplate the Parthenon is on a hill nearby, which you can access for free. Walking through the Parthenon is worth it though. Here, you can find people from all over the world. I actually practiced my Catalán on top of the Acropolis. 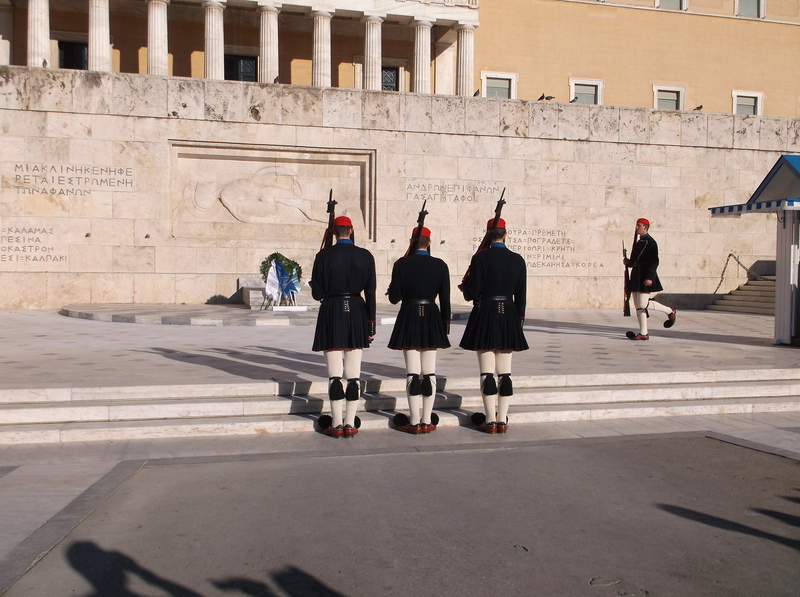 The Changing of the Guard is another must see. During my time in Greece, there were a lot of protests. It was cool to see the protesters split into two to allow the guards through for the changing. I prefer this Changing to the more famous one in London. I watched it a few time during my short stay. My favorite daily ritual was finding the best view for a sunset. 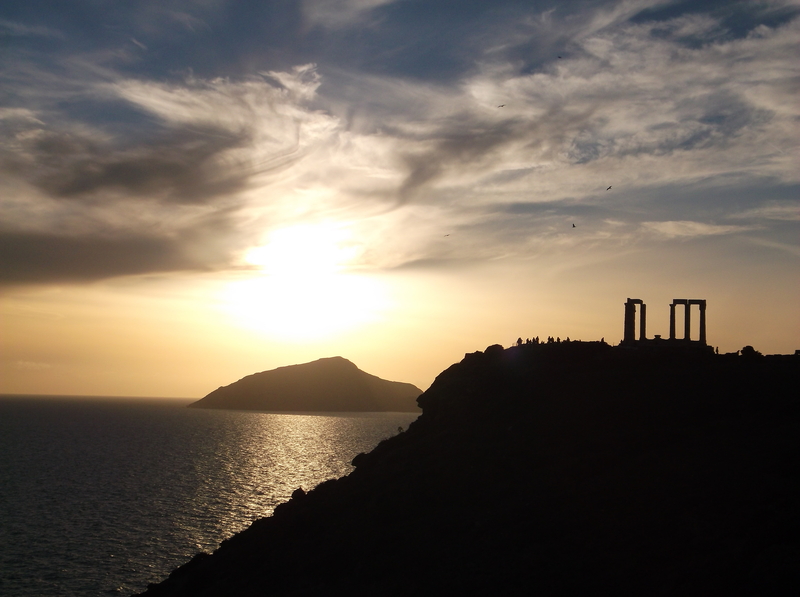 The most famous sunset in Greece is probably Cape Sounion, 69 kilometers (43 miles) south of Athens. You can watch the sun set over Posiedon’s Temple and the Aegean Sea with some of the most amazing views and colors ever. There is a bus from Athens for those without a car. In Athens, for an incredible sunset over the city, make your way to Lycabettus Hill, not far from the Syntagma Square and the Parliament Buildings where the Changing of the Guard takes place. The food in Greece is some of the best in the world. 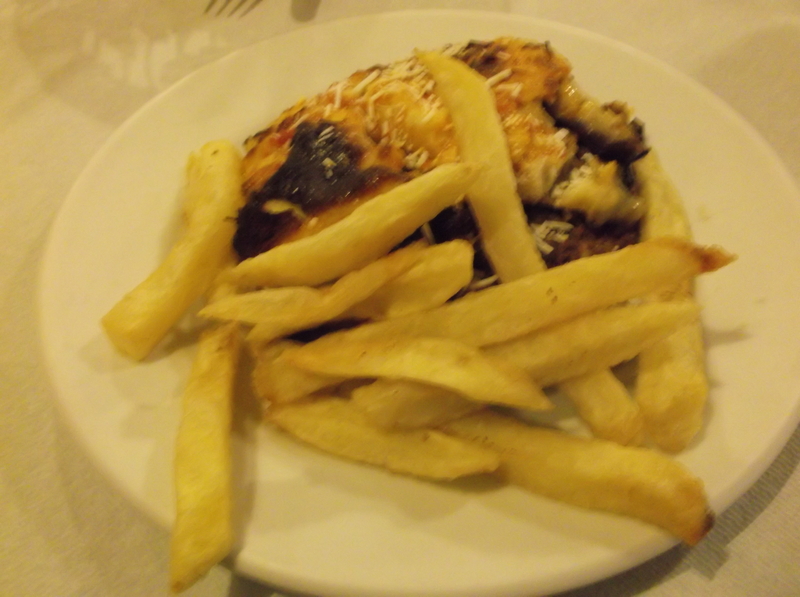 The typical Greek salad, a bit marked up in tourist areas, is great, and moussaka (think lasagna made with eggplant, in the photo buried underneath the fries/chips) is now one of my favorite foods. Greek yogurt with honey is an excellent dessert. 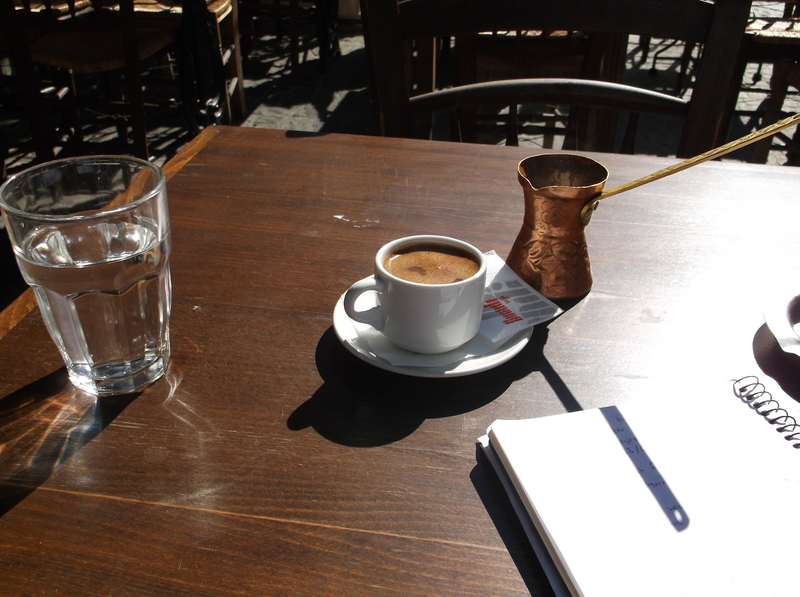 Greek coffee is also worth trying, or if it’s hot, the frappes are also quite good for the coffee addicts. And for the record, I did try ouzo, on a full stomach, and while I am a lightweight, it’s true…after only one ouzo, I was drunk. One thing to remember when travelling for Greece is to pack patience and an open mind along with the sunscreen and camera. Things can be changed last-minute. I originally had planned to go to Meteora, a place with several monasteries on top of spectacular cliffs. This plan was changed because my trip coincided with the Greek Independence Day on March 25th, and they had a nice transportation strike planned that day that I didn’t know about. 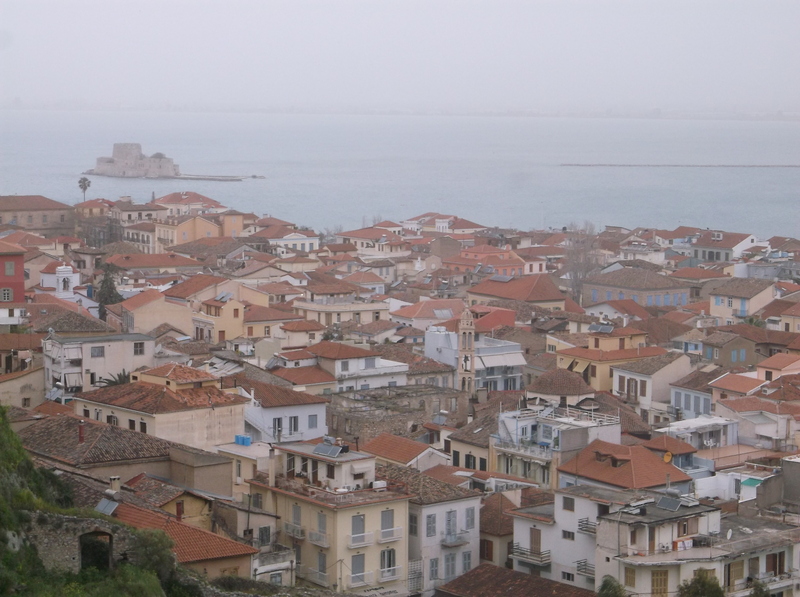 Instead, I went to Corinth and Napfoli on the Peloponnese Peninsula. Corinth had no clear marked bus stops, and the bus I needed was a good 6 kilometer trek from where I was, as I had gotten off at the wrong stop. When I finally got to Napfoli, I was tired but excited as Napfoli is astonishingly beautiful. As I kept an open mind to last-minute changes and went with the flow, I found a suitable alternative. The Greek culture is not known for its organization. On the bus back from Napfoli to Athens, I had a moment of panic. I had stopped in Argos, a 7,000-year old village near Napfoli, in an effort to see more of Greece. I got the last ticket on the bus to Athens, and I ended up losing the ticket after taking my seat. The control borded the bus, and as I speak no Greek, I started to panic as I couldn’t explain the situation. However, the cute guy next to me was bilingual and explained it for me. No extra charges, and a sigh of relief. One of my regrets is only having six days there, which did not give me enough time to explore the islands. Santorini and Mykonos are on my must-see list. I also have to return to go trekking in Meteora and to see Delphi along the way. Greece is an incredible country that I want to return to as soon as possible. There is something for everyone here. This is a popular Spanish refrán (saying) that I first heard in the 2000 Mexican film Amores perros, and it stuck with me. It’s the perfect quote for ANY trip, whether it be just a day trip to that beautiful place an hours drive from your home or that dream honeymoon you’ve planned since you were eight. Things happen, and things never go as planned. While I think I’ve only had one genuinely bad trip in my life (Mallorca, I’m looking at you), I have had a lot of trips where things go wrong. In Santiago de Compostela in 2009, I lost my debit card. I was there during the middle of Semana Santa, which meant all the banks were closed for the Easter festivities. I was able to report it missing, but I had about 20€ on me with the journey back to Madrid and on to Linares awaiting me. I was worried sick as I had a café con leche and tarta de Santiago, using the free wifi at that cool café to email my mom asking for money. I was very lucky she was able to put money in my American account so I could get back to where I was living. I have also been lucky (just knocked the wooden table I’m sitting at) that I have only had ONE lost suitcase. Last year, returning from Christmas in the States, I met up with a snowstorm in Chicago. After two hours sitting on the runway, we finally took off, and while I made it through the connecting flight in Brussels, my poor suitcase did not. However, they had alerted the Bilbao airport to my luggage being in Brussels, and it was delivered straight to my flat the very next day. Mallorca for me was a bad trip because of things going on in my life. I had just found out that the guy I had been crushing on for a year only saw me as a friend (always the friend and never the boyfriend! Pfft) and had just been told that my job was not renewing me because I was “too reserved”, so this put a damper on the whole trip. I was a bit annoyed whenever I went into a bar I was greeted not in Spanish, not in Mallorquín but in GERMAN. Is Mallorca no longer Spain? The entire trip was overcrowded with German tourists when I was looking forward to getting to know the Mallorquín culture. I’m planning a trip to Germany next year most likely, and I will learn about their interesting culture and language then. But when I’m in Spain, I want to learn about how different places in Spain do things different, as Spain has 17 distinct cultures and more languages than people. A broken heart and overcrowded touristy places are a sure way to make a trip bad for me. Things also come up that change your plan. A transport strike in Greece forced me to change virtually all the plans I had been spending months making last-minute upon arrival in Athens. It turned out to be one of the best holidays ever, and I am dying for a return visit. (If I don’t do Germany-Czech Republic-Austria next Semana Santa, it *will* be a return trip to Greece or Morocco). I had been spending most of my life wanting to try snowboarding, and last March, an opportunity came up with my school to chaperone a day in the snow in La Rioja. I was doing well after the quick snowboard lesson, and one of my students challenged me to a slope that was a step up from the bunny slope. Due to someone NOT getting out of my way, I fell and sprained my ankle in the process. It took two and a half months to finally heal. When traveling, delays and cancellations are always possible. Sometimes a positive attitude will get you places. In 2005, when my mom and I were going to Puerto Rico, the first plane’s engine was giving problems. Now, it may just be me, but I’d rather have the flight cancelled than to be on a plane with a faulty engine. Yet the poor desk agents were being cursed by angry businessmen. Last time I checked, the desk agents most likely are not trained in plane engine mechanics and are not Supermen/women. When we treated them nicely and with respect, we were booked on the next flight to Orlando to catch our connecting flight. However, this flight would turn into a disaster thanks to a thunderstorm over Orlando that gave the plane two hours of circling before having to make an emergency landing in Daytona to refuel. Eventually we were able to go to Orlando, where we had to run across the airport, pass through security again (thank God we didn’t have any liquids) and were upgraded to first class due to our all troubles. The less said about my experiences with Ryan Air, the better. I’ve taken a divergent memory serum to forget all about them! Things happen. Life happens. When it does, just remember to take a deep breath, relax and keep an open mind. It’s annoying to have flights cancelled, lose your wallet or passport or whatever, or be met with transportation strikes. However, remember these things can happen anywhere and to anyone. You’re getting an opportunity to travel and see the world! Focusing on the positive is easier said than done but well worth the effort. What have been YOUR worst travel experiences? Were you able to turn them around and enjoy the trip? Greece. A Dream Come True.